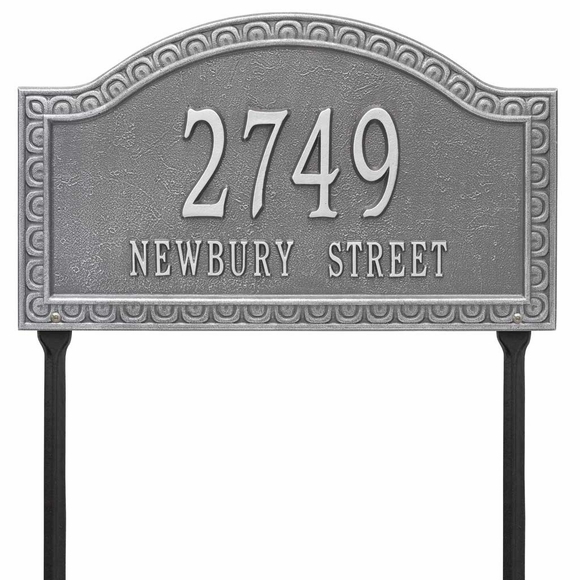 Yard Mount Address Sign - - personalized address plaque. Extra-large arch sign includes two 18" lawn stakes and five (5) 4" numbers. Made in USA. Detailed scalloped border accents the wide arch shape. If you are buying a 1-line sign, please leave the Line 2 input box empty. Large image color: pewter silver. Smaller images (from left to right): antique copper, black/gold, black/silver, bronze verdigris, oil rubbed bronze, bronze/gold. Dimensions: 19.5"W x 11.5"H x 0.375". Classic arch lawn sign with five 4" tall numbers is easy to see from the sidewalk and street.